It’s not like English needs the letter X anyway. Anything with an X in it could be spelled with some other letter or letters, usually ‘ks’ or ‘z’. 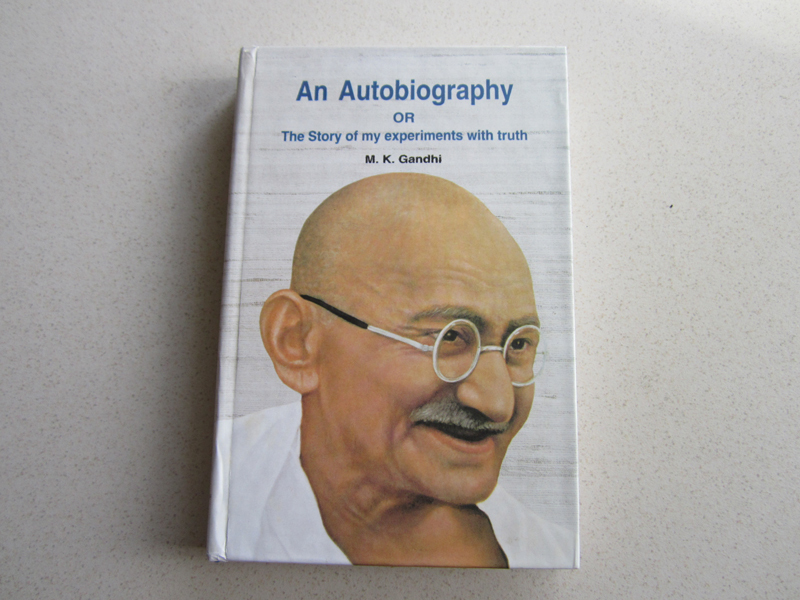 A funny thing happened when I was reading this book. 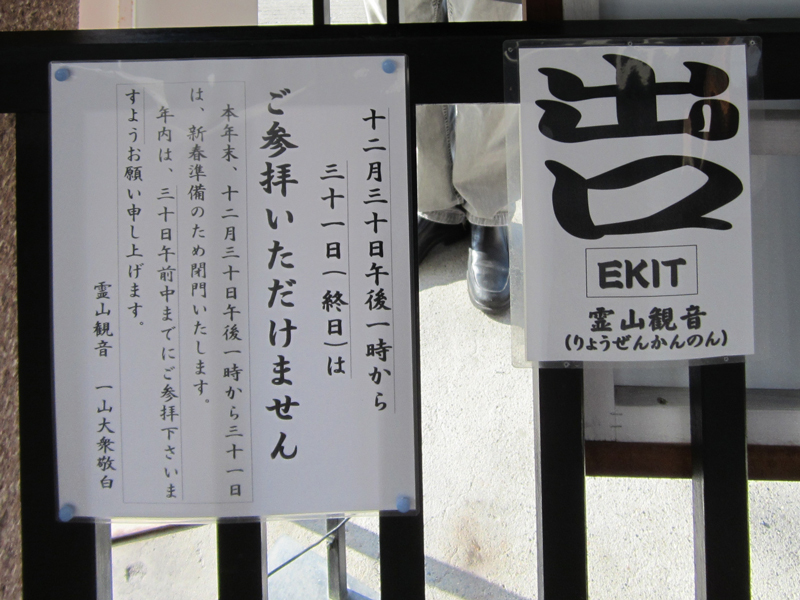 What does this heading say? I somehow read that as EVIL COMPANIONS. Because the ‘X’ looks like an ‘E’ and the period next to the ‘I’ makes the ‘I’ look like an ‘L’. One reason why I think I was so ready to read ‘I.’ as an ‘L’ is that the print quality of the whole book was not so good, and letters or parts of letters were often missing. My eyes had gotten used to filling in ‘missing’ parts, and filled in an ‘L’ where there actually wasn’t one. Reminds me of the time I misread ‘China Unicom’ as ‘China Unicorn’ early on when I was working for China Knowledge. There’s a word for what happens when letters are too close together. Letter spacing is called ‘kerning’. Bad letter spacing is jokingly called ‘keming’. Below are 27 selected photos of a brief trip with friends to Siem Reap, Cambodia. This warning, spotted in The Clementi Mall, makes it sound like the belongings themselves are dangerous, like a sign that says “Beware of Dog” or “Watch Out for Falling Rocks”, though admittedly neither of those warnings starts with ‘please’. Of course the intent is something like ‘take care of’, and ‘watch out for’ sometimes has this meaning. “Watch out for your children” means ‘keep a lookout’ so that they come to no harm, but the meaning doesn’t transfer to inanimate objects as nicely. While we’re nitpicking, we might as well point out that the exclamation mark seems extraneous. No final punctuation is needed since the words are all capitalized. Alternatively, only one capital letter is needed, since it’s a sentence with end punctuation. 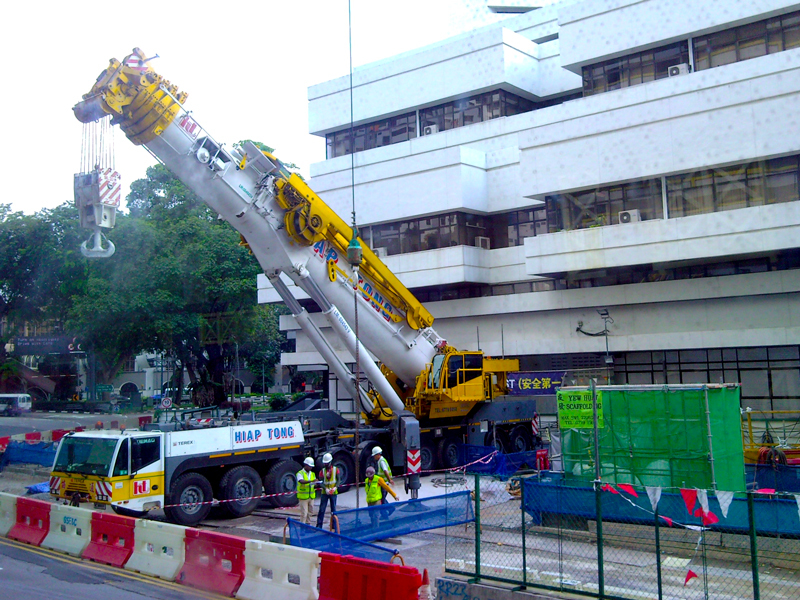 Dumex, proudly nurturing Singapore babies with global expertise and experience. 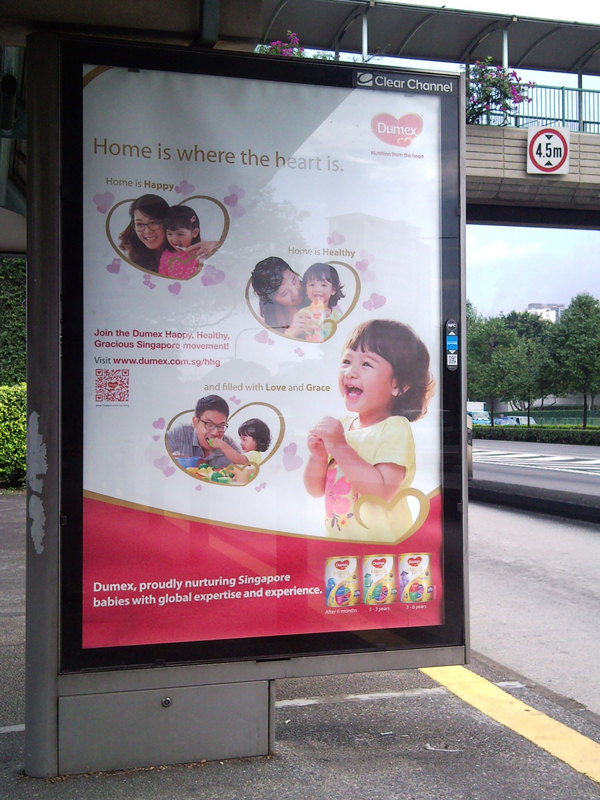 I thought, Wow, Singapore babies have global expertise and experience? The preposition ‘with’ is ambiguous. It could mean ‘having’ (which is what I thought at first) or it could mean ‘using’ (which is what was intended). 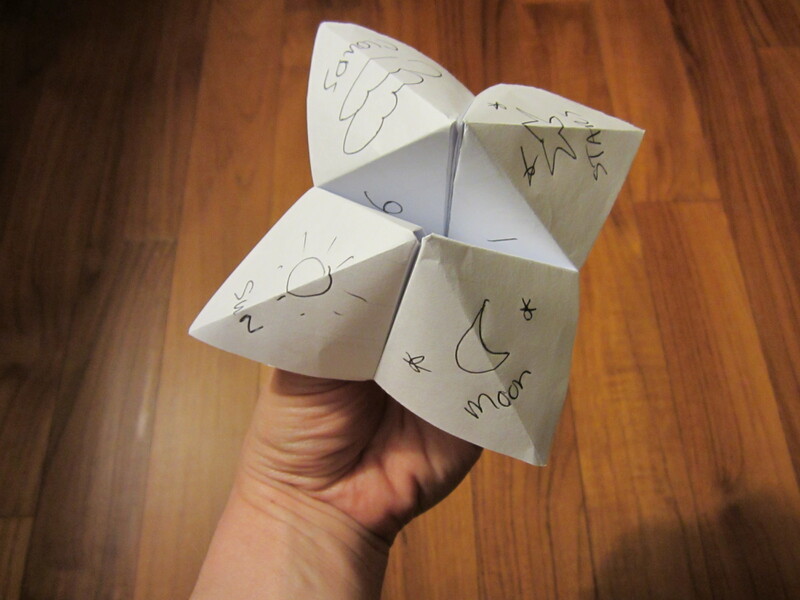 When I was working full-time at an enrichment centre, I made paper fortunetellers to amuse kids who are waiting for parents to pick them up or fill out registration paperwork or whatever. Sometimes I gave them away… it was easy to make new ones and it made kids so happy. The ones I make now are slightly different from the ones I made when I was a kid, which start off with red/green/yellow/blue and inside have something gossipy inside about who you are going to marry or whatever. 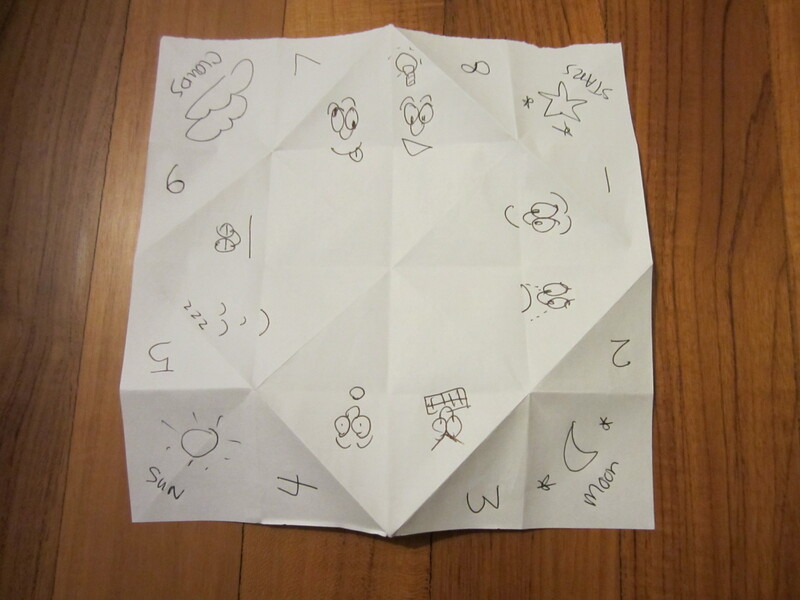 My fortunetellers have sun/moon/stars/clouds on the outside, because these all have different numbers of letters and are all things in the sky and can be depicted easily using a pen or pencil (rather than colored crayons, markers or pencils). 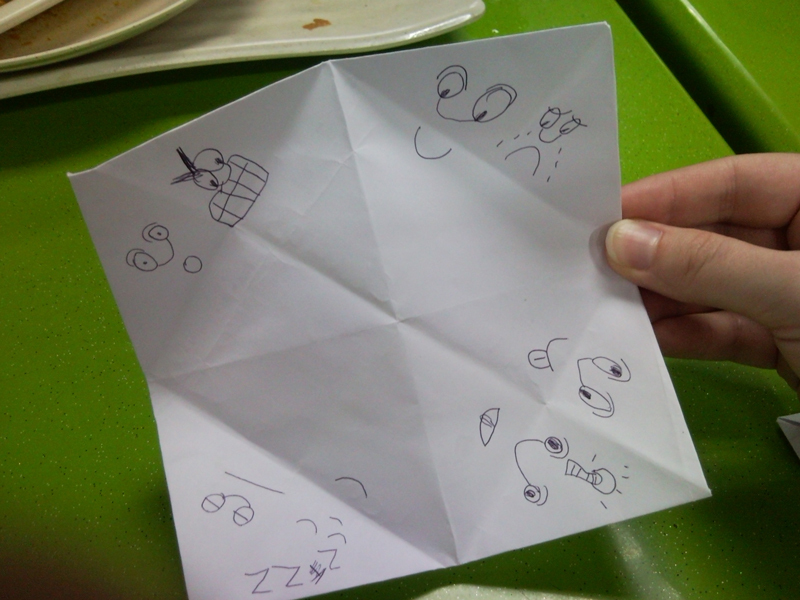 The ‘fortunes’ are just faces: happy, sad, angry, surprised, sleeping, bored, silly and ‘idea’ (you’re a genius!). Even though I’m not teaching anymore, I still carry a fortune-teller in my wallet, in case I run into a child who needs to be amused… don’t laugh, it happens! For example, when my husband and I ran into some neighbors at Haq-Insaf’s Eating Place, I was able to amuse their young daughter. 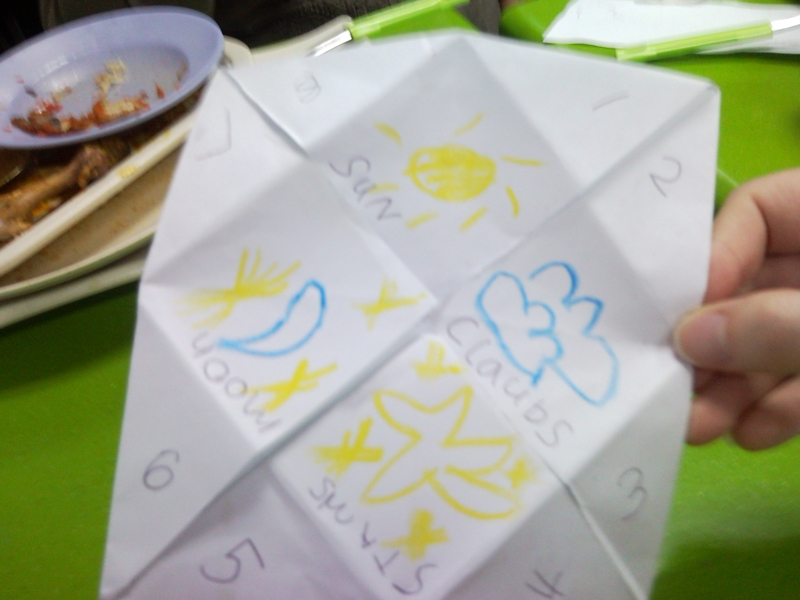 After playing with my fortuneteller, she even made one of her own! My husband and I rode in a taxi that had a confederate flag displayed on the dashboard. 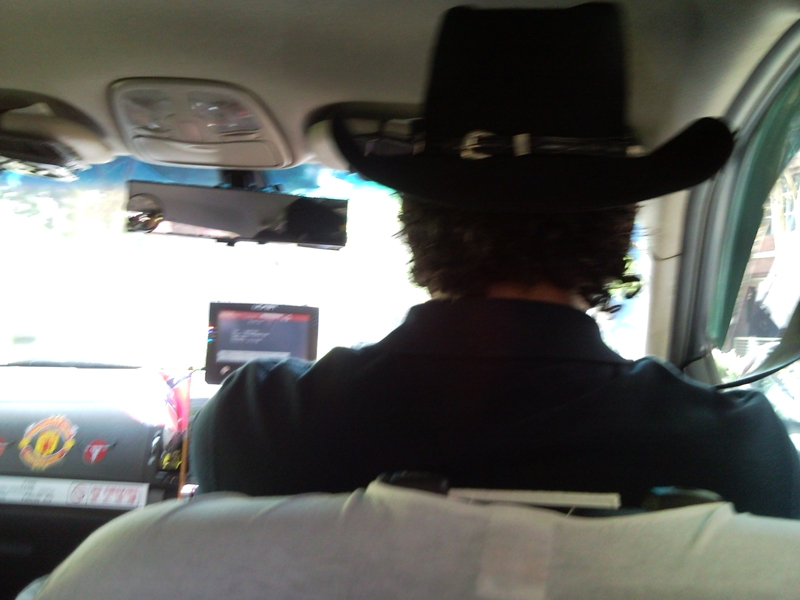 The driver had full cowboy getup. 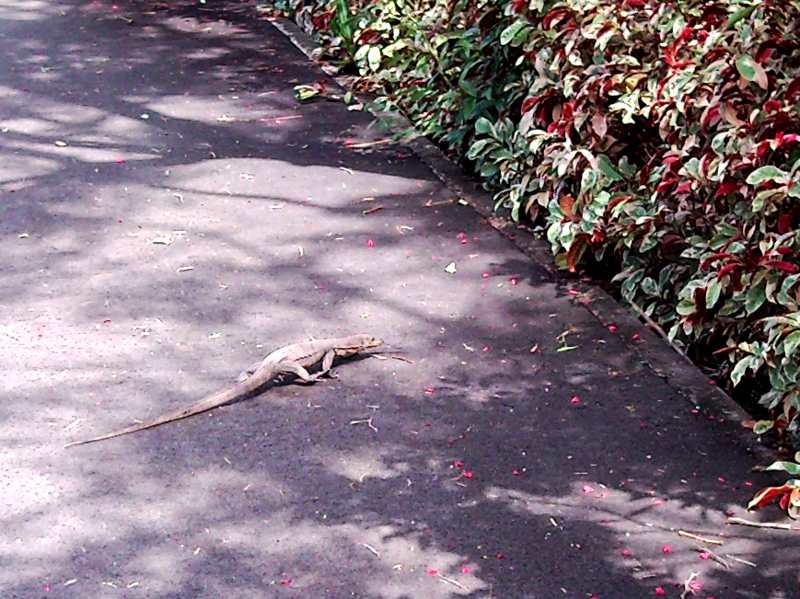 We chatted with him. Apparently, country-western is a culture with which he identifies. Strongly.